Aughlisnafin U10.5s who were the Cup Runners Up at the Ballykinlar Tournament on Saturday. *Our U14s won their opening championship game away to St Paul’s last Monday evening. St Paul’s led by the minimum at half time before a strong second half performance got the Fin over the line. Next match is at home to Drumaness next Monday 27th August at 7 pm. 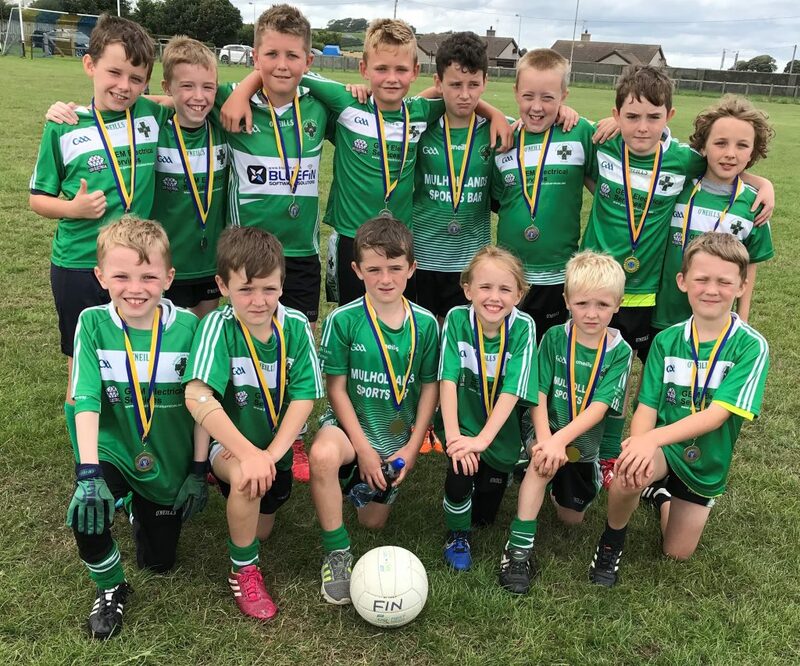 *Our Year 6’s travelled to Ballykinlar on Saturday morning for their annual U10.5 tournament. With six clubs in attendance all the teams played each other in a round robin format. The Fin won their games against Ballykinlar, St Paul’s, Teconnaught and Bredagh and drew with Castlewellan to reach the cup final where they met Castlewellan again. Despite their best efforts the Fin fell short and found themselves picking up runners up medals for a second Tournament cup final in two weeks. Aughlisnafin: R Croskery, D Brennan, Dd Steen, J Lenaghan, Dl Steen, C O’Hare, C Flanagan, B Clarke, M Murphy, S Boden-Hall, E Croskery, A Croskery, Rory Quinn. *Our senior team were back in league action after break of three weeks with no competitive action. Despite this they played well against Bright with only a point separating the sides at half time. Four points from Shane McCann keeping the Fin in touch with Shane Mooney, Oran Flanagan and Paul Flanagan also on target. Half time Aughlisnafin 0-7 Bright 0-8. In the second half a superb goal from Rory Murphy swung the momentum to the Fin. Two points in succession from Mooney and a super score from the captain Sean Fitzsimmons edged them further ahead. With numerical advantage for the last ten minutes Bright clawed back the deficit. They scored a goal of their own and some great points to win by five points in the end. Oran Flanagan getting three more points for the Fin before the full time whistle sounded. With the game a dead rubber affair in terms of the league positions it gave both teams a good run out before their championship games against Ballykinlar and Kilclief respectively. Final score Aughlisnafin 1-13 Bright 1-18. Thanks to NMG Road Sweeping for sponsoring the match ball. *It was great so see the U8s from both Aughlisnafin and Bright play an exhibition game at half time in the senior game between the two clubs on Friday night. Senior Match referee Peter Owens very kindly officiated and the kids really enjoyed themselves. *All roads lead to Páirc Seán Ó Caoilte in Dundrum this Thursday evening where our senior team play Ballykinlar in the Parador Lodge Junior Football Championship at 7 pm. Admission is £5, U16s are free. We invite all our members and supporters to come along in support. *Our U16’s will meet St Paul’s in their opening championship game next Thursday 30th August at 7 pm in Annsborough. * We will be hosting a ‘Pairc Baile Anna Meeting of Families Camp Out’ this Saturday from 3 pm. It will be £15 per tent and all funds raised will go towards the development of our underage teams. We invite all our club members, underage players, their siblings, extended family members and friends. *Other fundraising events include The Donard Summit Challenge on Sunday 16th September and our Wild West themed night in Annsborough Club on Saturday 22nd September. The Annual Club Dinner & Presentation Night will be held in Downshire Arms in Hilltown on Saturday 27th October. Jenny Quinn is the point of enquiry for purchase of tickets. *The club are still taking orders for their special edition pink jersey. Contact Jenny Quinn for your requirements before this Friday 24th August. *Lotto numbers 6, 7, 8,12. No winners. Jackpot £3,675.